Sorry for the misunderstanding. You quoted me though with your response, which is why I thought you were giving me a hard time. They were found close to Las Vegas. My friend and I were out hiking about 6 years ago and I ran across a part of the mountain where there were some of these and small chunks of a gray, frothy appearance obsidian on the ground. So I picked up as many as I could find. I examined the obsidian under the stereoscope and found that the appearance was due to being heavily micro-fractured. I have not been back since, but am thinking about going back to see if the heavy rains have uncovered anymore. No, I rarely ever go there. I just gave some to a geologist I know who said that is what they are. I am sending a bunch of rock samples to Canada for testing in a few weeks so I am thinking about sending one of these along as well. He also claimed that variscite is never found with turquoise, which was also wrong. Your garnets are amazing James. No doubt. Botryoidal behavior in a garnet does not seem like a possibility. I like Jan, found them humorous. Because we know garnets well and botryoidal formation of garnets is a mind blower. I never thought they were fake, just bizarre and interesting. I will guess that a geologist may be amazed also. Nice collection and very well described. 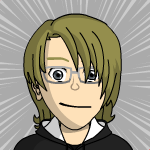 I really do look like my avatar... it kinda freaks me out. *Edit* Oops, hit enter too early while making this! What a spectacular collection! I was lucky enough to visit Ely a few years back so I have a few garnets in my collection, but nothing like this. Whew! A human mole. Great photo. True rock lover. drocknut, did you cab any of the garnets from the collection?? Thanks for your understanding, vegasjames. I hope you will consider sending the garnets to Canada to be evaluated, and please keep us posted on their findings. I wondered if they might be some type of garnet pseudomorph, such as limonite pseudomorph after garnet? Not sure how they would be conjoined like yours though, maybe the weather? "Limonite pseudomorphs have also been formed from other iron oxides, hematite and magnetite; from the carbonate siderite and from iron rich silicates such as almandine garnets." Muchos thanks for your kind comments, lennyb0b! Hi, aimeesrockworks, thank you for sharing your Garnet Hill pic with us! Looks like you're having a good time digging in the dirt. Hope you will share your garnets! We'd love to see 'em! Thanks for your comments. Nature does not always follow the rules we think it should. A while back I was out in the California deserts looking for meteorites. I ran across two oval stones several inches long that were heavy and magnetic. When I cut the one stone open it looked just like the Eagle's Nest brachinite meteorite so I sent it off to a meteoric lab for testing. It also turned out to be garnet. So garnet does not always form with crystal faces. These are not limonite. I am familiar with limonite and have found some really nice specimens in several areas of Southern Nevada. But it is not very common here and there is none in the area where these were found. 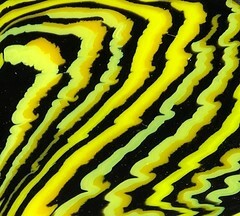 And limonite leaves a brown to yellowish-brown streak on a streak plate. These leave no streak. Gingerkid, nope not yet. I don't have equipment plus they are all pretty small. I'd like to eventually get some of the ones I got from Emerald Creek cabbed to see if they have stars. My house is for sale so I packed away most of my 'rock home decor' (since most folk don't understand that style of decorating). They're all in a box. Somewhere. Another name for grossular (which is blended mainly with andradite) is Mali Garnet. Because sorting out the actual chemistry of garnets can be very difficult, many garnet types are simply named after the areas where they’re found, in this case the nation of Mali in west Africa. 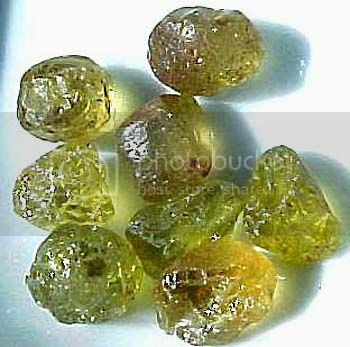 The majority of Mali garnet is plain grossular (which takes its name from the greenish-yellow color of gooseberries.) 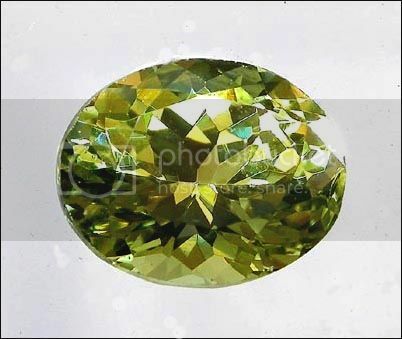 But some is blended with andradite which gives it unusual hues and brilliance. This is Mali garnet gem-grade faceting rough. Some is greener and some trends toward the orangy-brown. This Mali grossular, with a large percentage of andradite, displays visible “fire” or dispersion, typical of that species. Very nice Rick. And only a couple of the rough pieces display traces of crystal faces. drocknut, I hope you cab some of the Emerald Creek garnets soon! aimeesrockworks, sure hate to hear that your pretties are boxed up. 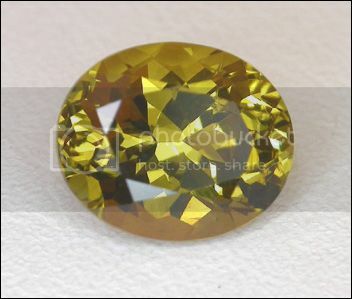 gemfeller, the Mali garnets are gorgeous! Please share more with us!! gingerkid, I don't have any equipment so not gonna happen anytime soon unfortunately.